Truthers — On Monday a new independent expenditure group was created called The Truth Alaska. 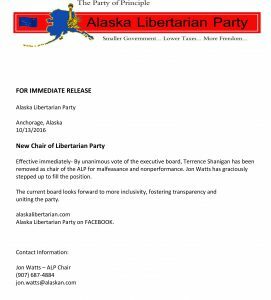 The group is clearly being formed to counter the union-funded Together for Alaska. We are told the group is being fronted by Republican insiders Bruce Schulte and Dan Coffey, Lobbyist Ashley Reed, and political consultant Art Hackney. So far they report only a $10,500 donation from the Associated Builders and Contractors, but we hear their goal is to raise $100K and will primarily target Senate seats B (Coghill vs. Hopkins) and N (Giessel vs. Beltrami). Kind of late to the party with 25 days to go. Reeling — The campaign for House Rep. Liz Vazquez appears to be reeling. Tales abound of her melting down at recent Republican gatherings and now she has filed her 30-Day APOC report 2 days late. Once she did file the report it showed she had only raised $44,757. 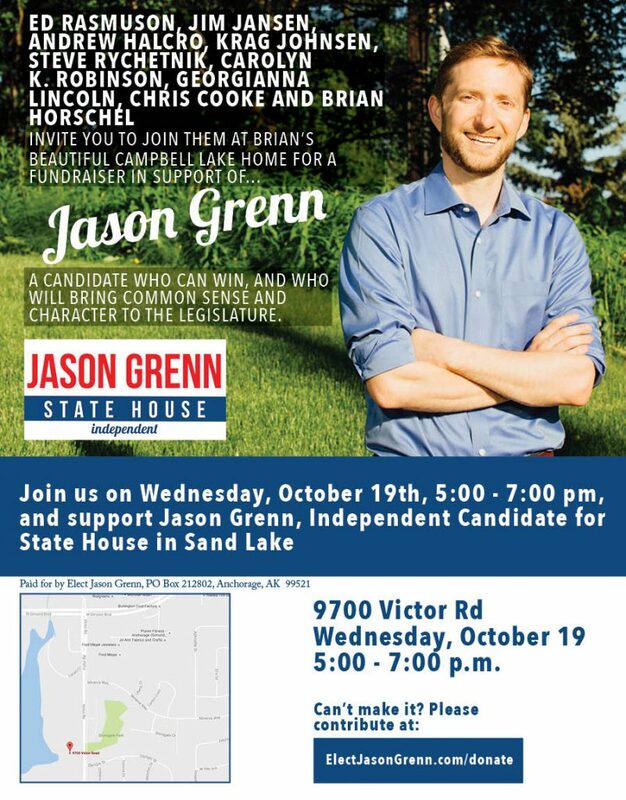 That is a pretty paltry sum for a candidate widely regarded as being in a tough fight against a quality opponent in Independent Jason Grenn. Adding to that is the fact her APOC report shows she is spending money to hire lawyers to send letters to people running ads against her and hire a “brain trust” of “political consultants” Bernadette Wilson and Michael Chambers (Note-the quote marks in this sentence were actually us air quoting so hard we nearly sprained something). Smoke Signals — We are hearing a lot of rumors about Mat-Su Republican Senator-elect David Wilson meeting with Democrats Tom Begich and Sen. Berta Gardner. Does that mean Wilson will organize with a bi-partisan crew? Not necessarily, but it does sound like Senate R’s are a little worried about it. 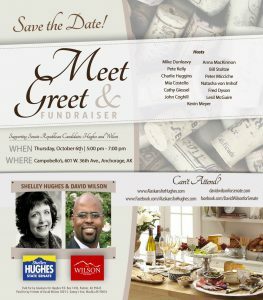 Another interesting sign of where the senate majority may be headed can be found on the flyer for the recent fundraiser for Wilson and fellow all-but-certain Mat-Su Republican Senator to be Shelly Hughes. 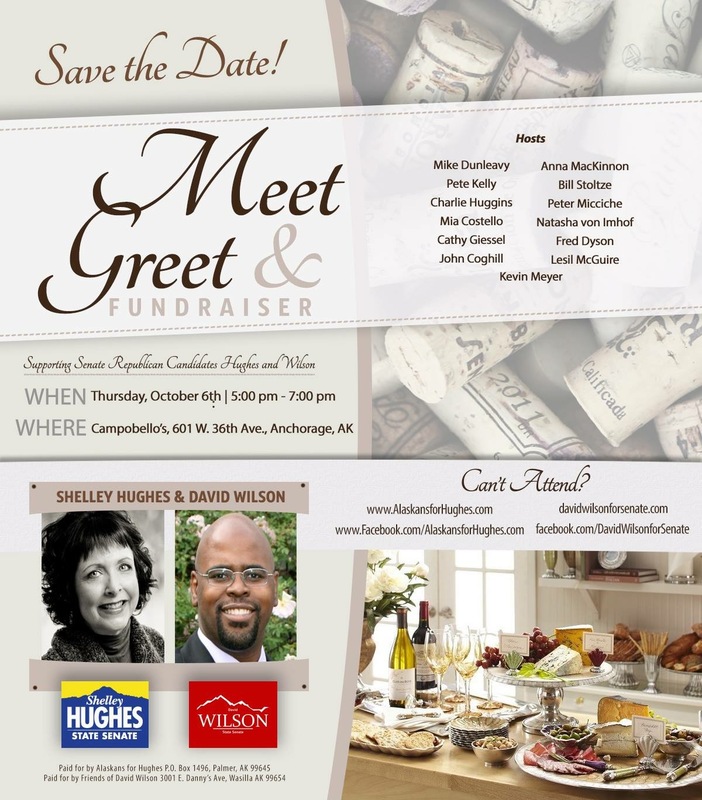 The event was clearly more to help Hughes than Wilson and listed as sponsors for the event are all the current Republican Senator except Sen. Bert Stedman, Sen. Gary Stevens, and Sen. Click Bishop. Is that maybe an indication of where Senate organizational lines may be drawn? 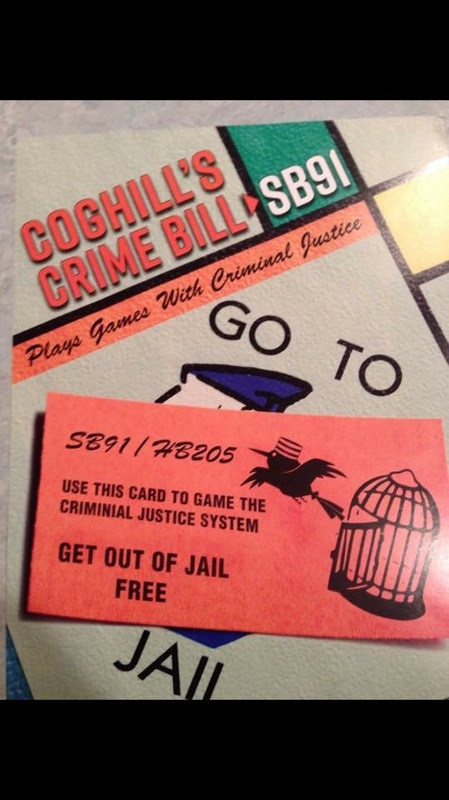 Cross Currents — The primarily union-funded independent expenditure group Together for Alaska is now sending out mailers attacking Sen. John Coghill for his work on the crime re form bill SB 91. It is an interesting issue to follow in campaigns because the issue and bill itself has strong defenders and harsh critics on both sides of the political spectrum. Similarly, the bill was pushed by Democrats such as Sen. Johnny Ellis, but staunchly opposed by a few including Rep. Andy Josephson and the generally Dem-friendly public safety unions. Since this isn’t an easy left/right paradigm, it will be interesting to see what internal rifts an issue like this will expose. 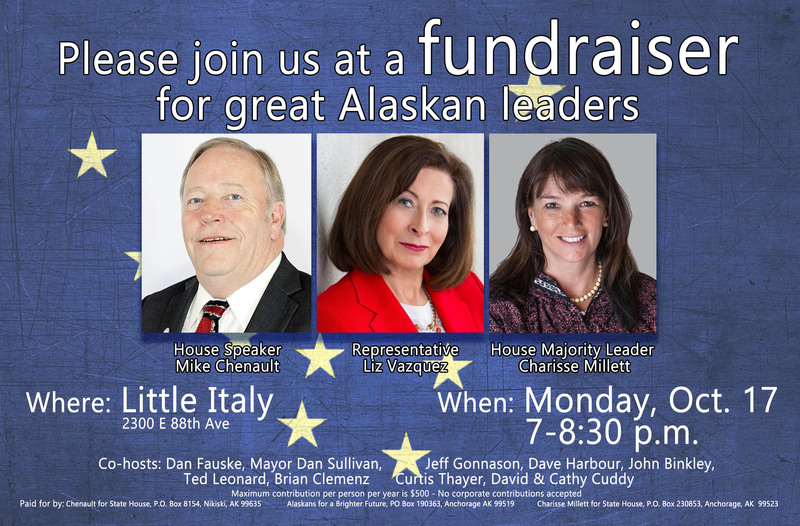 We are already hearing some Dem insiders grumble about Together for Alaska going after Coghill on this issue and on the other side tails of Republican Party leaders having referee spats between Coghill staff and Republican Senate candidate Kevin Kastner over the issue. On The Record — At the recent state house and senate candidates debate at UAA the senate candidates were asked if they were supporting their respective parties’ Presidential nominee. Sen. Cathy Giessel said she was supporting Donald Trump, while District L candidates Republican Natasha Von Imhof and Democrat Forrest McDonald said they were undecided. Because of the way the question was structured Vince Beltrami had the out of saying since he is an independent he has no party candidate to support. Inexplicably the house candidates were not asked the same question. But as the number of candidate forums and debates ramps up in the last three weeks of the campaign, watch for this to be a question that puts candidates more and more on the record on a question they really don’t want to be. Unanswered Questions — The move by Sen. Lisa Murkowski and Sen. Dan Sullivan to rebuke Donald Trump leaves a lot of yet unexplored angles. One such interesting question we have put to the Murkowski campaign, but not answered is whether Murkowski, now that she isn’t supporting Trump, still feels Pres. Obama’s Supreme Court nominee shouldn’t be given a confirmation vote? If both Clinton and Trump are as bad or worse than Obama, what is the point in waiting for their choice? D-40 Aftermath — The Alaska Supreme Court victory of Dean Westlake means the fight over how the state house will be organized next year is tighter than ever. Those trying to hold a GOP lead majority and those trying to organize a bi-partisan coalition will need every vote to get there. That heightens the stakes in the race between Democrat Pat Higgins and Republican Rep. Charisse Millett. Rumors are the race has tightened and Democrats think they have a real shot at knocking off the House Majority Leader. The race took an interesting turn last weekend when Millett retracted her endorsement of Donald Trump in the wake of comments he made about assaulting women. Several irate Republican loyalists, including Anchorage Assembly member Amy Demboski, took to social media and the radio waves to say how they viewed Millett’s lack of support for Trump as support for Hillary Clinton since the presidential race is a binary choice. The irony of that argument wasn’t lost on us, since Republicans not supporting Millett would lead to Higgins being elected, which itself could tip the scale to a bi-partisan majority in the state house. That would put Rep. Les Gara and Rep. Chris Tuck in positions of power. D-40 Aftermath (Part Deux) — In background conversations with folks on both sides of the aisle this week, we asked if the mistakes made in administering the primary elections in rural Alaska this year would cost Alaska Division of Elections Director Josie Bahnke her job. We were surprised by the unanimity of opinion from Dems, Republicans, political consultants, pollsters and lobbyists that Bahnke is a goner. The mistakes made in the elections were bad, but everyone felt the real death knell for Bahnke was her inability to explain the issue or even maintain basic composure during legislative testimony and media interviews afterward. Also even though there is no evidence DOE is at fault, both Donald Trump and Libertarian presidential candidate Gary Johnson were absent in the Official Election Pamphlet, the optics of it are bad for the state and Bahnke doesn’t seem to have understood that before the fact. The consensus was that we should keep an eye out for Bahnke being promoted out of the way soon after the election by being made a Deputy Commissioner or given some other high-level spot. 2 Comments on "Friday in the Sun!!! (October 14)"
Are they undecided, or just chicken to say what they think? Gosh, even Lusa Murkowski finally gave her opinion du jour.